My lasting impression is this- in Bologna you eat better than in Florence, period. The food in Florence can be extremely disappointing and there are only a handful of eateries left where you eat truly well. It’s not that Florence doesn’t have amazing food from it’s traditional culinary repertoire, the problem is that the city doesn’t showcase it. Read old Tuscan/Florentine cookbooks like “Il Libro Vero della Cucina Fiorentina” by Paolo Petroni and you’ll find delicious dishes, most of which are non-existent on the majority of menus around town. Florence overall has sold out its dining scene to mass tourism, instead of saying “hey- we are proud of our cuisine and people should eat it or leave it!” These Florentine restaurateurs have underestimated the curiosity of foreign diners OR have surrendered to the incurious. Accept my apologies for constantly comparing Bologna and Florence, as it’s almost unfair, but allow me to indulge. When I say eat well, what am I talking about? Food that is done well, with high quality raw materials, skill, technique (please, no microwaves) passion and respect to tradition and authenticity. Florence has the meat game down, that’s for sure. Steak, game meats, roasted pork loin and other pork things, rabbit (sorry, bunnies), beef stews, wild boar, meatballs- Florence is your protein heaven. And Bologna does a pretty good job too albeit with a less ample yet similar selection, their strong point is definitely pasta in my eyes. So considering that meats are more or less comparable in quality between the two areas, I am pitting the two each other in terms of primi, first courses. 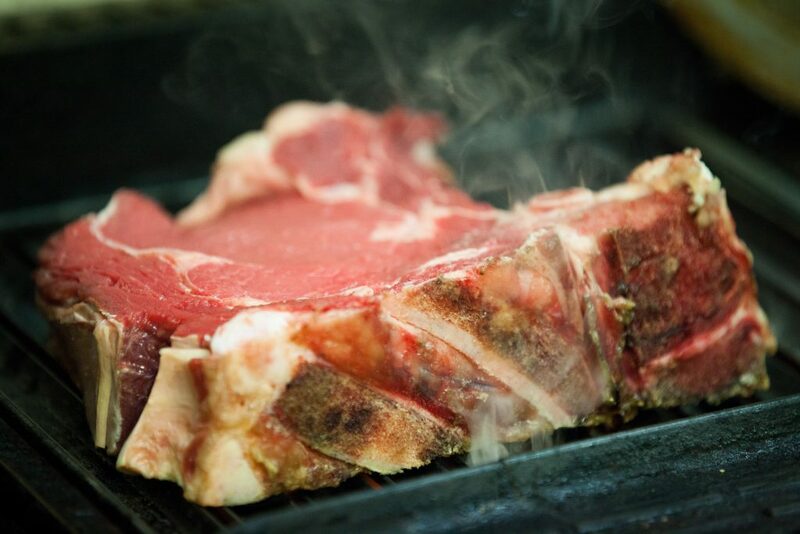 Meats are considered secondi and if you’re like most normal people, you perhaps take a second course once a while. More than likely, pasta and soups, grouped as primi, are lighter for everyday consumption and meat dishes from traditional eateries feel part of a banquet holiday dinner. This is why on the dinner crawl, we focus on family-style meat courses because to me meat-eating should be a communal affair. 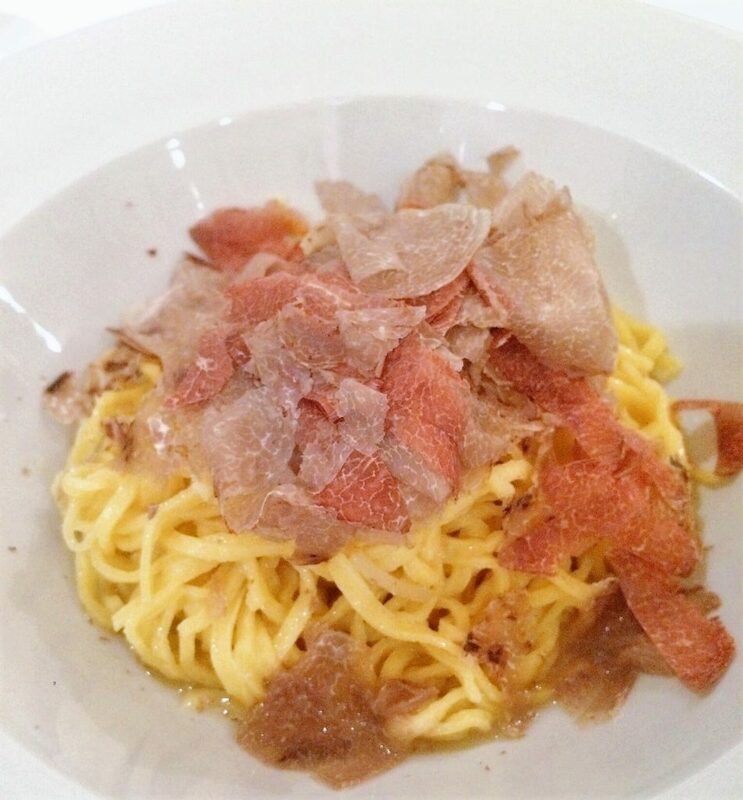 And I still stand by food tours in Florence, and think the places we visit are worth eating at. Honestly, meat in doses like those doled out from la bistecca fiorentina, peposo or any meats in umido should be reserved for special occasions. Again, I’m going to quote my nutritionist sister’s influence but the amount of protein whose waste product your kidneys should probably handle at each sitting is about 3.5 ounces, i.e. 100 grams. But who does that really when a steak or a big bowl of slow-cooked meat is put in front of them? Or when a slab of porchetta, stewed wild boar or anything else is staring at them at the table, glistening with flavor beckoning to be demolished? When comparing Florence and Bologna, I’m speaking also about the overall quality of food procurement. On the northwestern Tuscan coast of Massa-Carrara where I toured recently, they fill their “tordelli” with meat and herbs, which potentially says that this area historically was rich like in Lucca where they also fill their tortelli with meat. 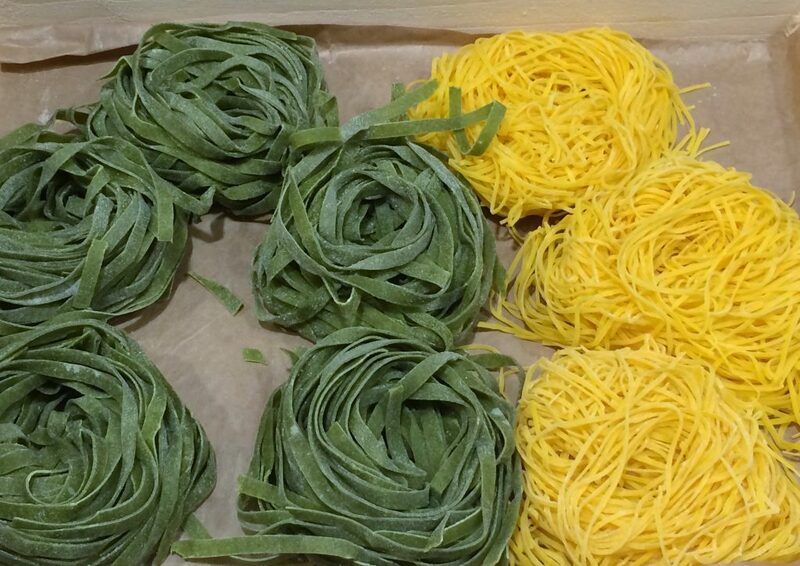 Pappardelle from Siena resemble tagliatelle but just wider but one thing we can all hopefully agree on is that the Emilia-Romagna is the kingdom for fresh egg pasta. The opinion I’ve reached is that Florence’s food scene is incomplete and it has sold itself out to mass tourism, more on that topic here on Eater.com. It has some rustic eateries dishing up acceptable fare but this new wave of “contemporary eateries” I feel are mostly fluff, trend and lack soul. This was confirmed after a recent trip to Rome dining at Retrobottega, a contemporary eatery doing small plates and re-visiting traditional foods and fusing them with bold flavors like saffron and pomegranates. To me, Retrobottega is doing “modern Italian” right. I still remember the flavors & textures from Retrobottega more than any most other fancy pants contemporary food joints in Florence, that honestly just win for ambiance. If you talk to any of the most trained & discerning palates in the country, many will say that eating well in Florence is a challenge and the contemporary dining scene is mostly baloney. A touch of Milan in Rome: silky smooth button ravioli filled with velvety savor veal shank Ossobucco in a saffron lemon broth. 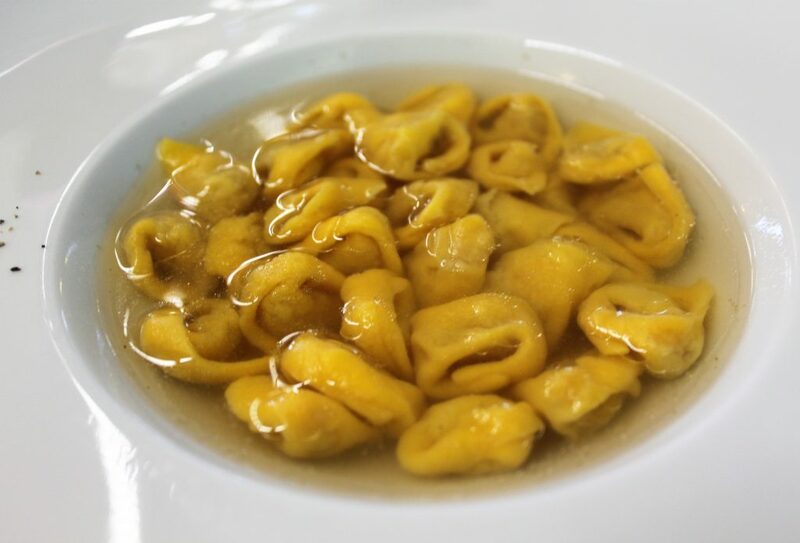 And the places in Florence dishing up quality traditional fare well are few and far between, the rest are and have been pandering to the tourist palate, and not that of the Florentine. Don’t get me wrong, there are incredible people cooking in Florence and I stand by every single one that I recommend, but Bologna got me thinking of the food scene at large. Whereas the average restaurateur in Bologna, and I’m not talking about cheap places catering to the student population, is catering to the Bolognese palate. The Bolognese who is on average one of the most poignant food critics because they were provided points of reference and taught pasta by their mother, or their grandmother. This is along the lines of memory of taste, that I am convinced gives the old world an advantage. And pasta is a thing full of love. If made from scratch, requires the use of hands from the impasto (dough) to rolling by wooden pin to the tiny, patient filling and folding. I sort of came up with this idea that while the south has breads and pizzas, it is more of a masculine food. You usually associate pizza chefs, bakers and pizzaioli as men. Not to say that women aren’t or can’t- think of the most famous pizza chefs in Italy are they will usually be men (like Gabriele Bonci), think of the most famous tortellini makers in Emilia, usually woman (Lucia Antonelli or, any Mamma). 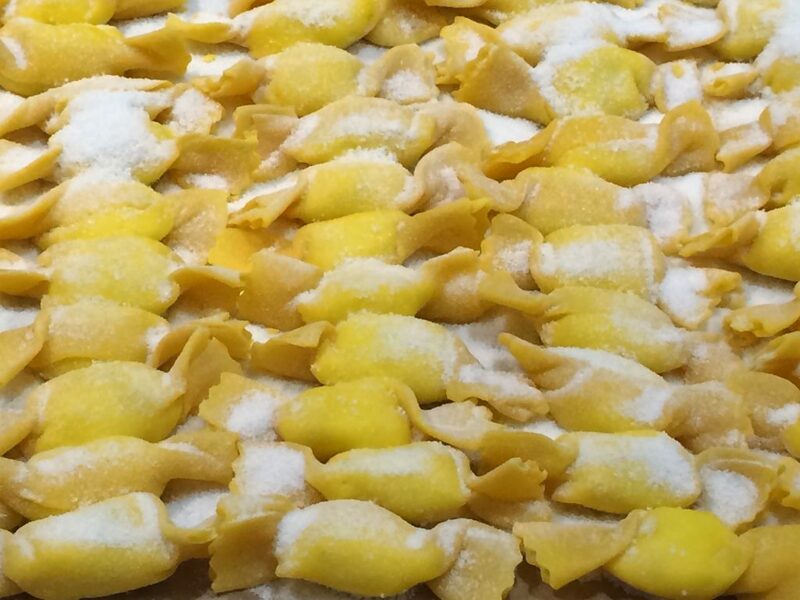 Whereas the image that people associate with pasta is la mamma or nonna, where nurturing heart and soul is. And this is why I think pasta is food which invokes so much debate. 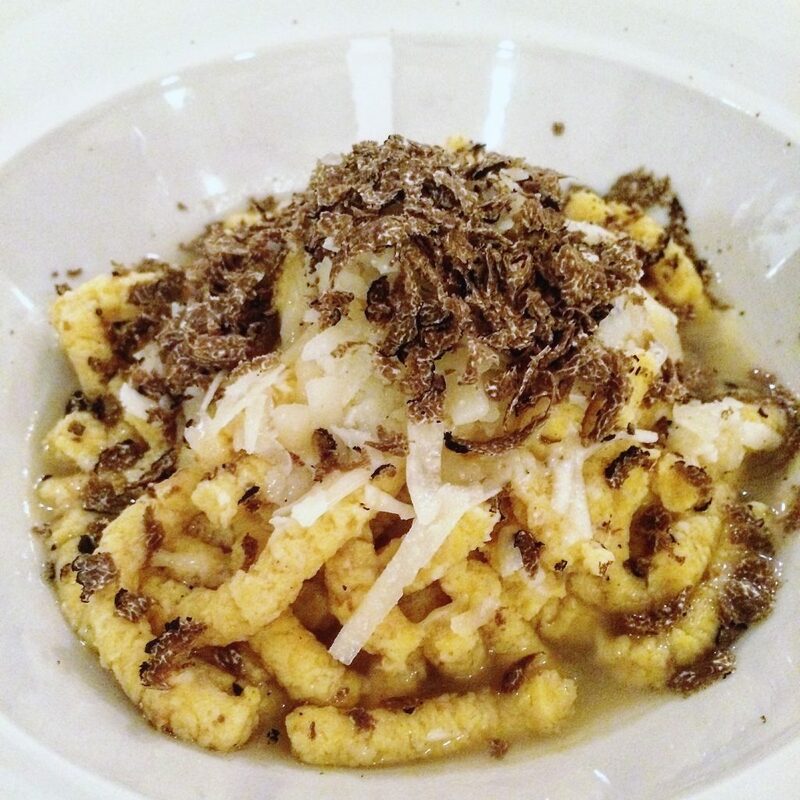 Food memories for pasta-reared Emilians are possibly riddled with childhood emotion. Every time I asked a Bolognese where I could find the best pasta in Bologna, their chuckle-ridden segway always began with “at my mom’s/nonna’s house, of course!” Then it would follow with eateries outside the center and a few within the Medieval walls. And no one really agrees on a particular recipe, since every family is different. Since Bologna is about 10 years behind in having the droves of foreigners beating the pavement compared to Florence, eateries have mostly Bolognesi in mind as their clientele. Whereas, the few Florentines in the city go to a select places or also outside the city. The rest of the dining population are visitors, American students who usually have more expendable money than Italian students and foreigners/expat immigrants, who also tend to spend more than locals. And in my opinion, many restaurateurs in touristic cities like Florence make the mistake of procuring mediocre food, opening an eatery not because they have great culinary passion & skill but because they know there is enough visitor traffic to make it a viable enterprise. 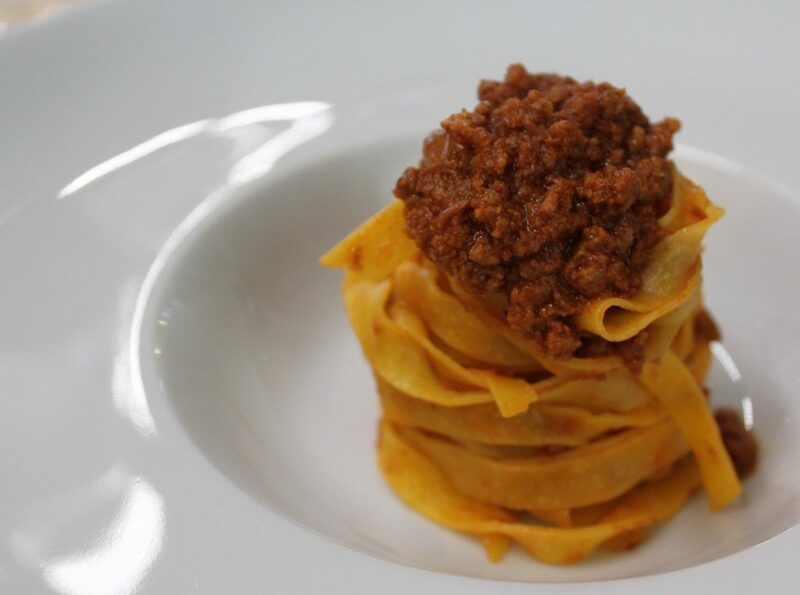 But I am convinced that the average palate of a Bolognese is more refined and developed than that of a Florentine. Because their regional cuisine is much more elegant, rife with golden products like butter, parmesan, egg pasta and a library of cured meats. Not to mention, there are truffles that grow here, wild herbs, a bounty of vegetables (which I still have yet to see many of on plates) balsamic vinegar from Modena (which I’ve learned to not talk about in Bologna, i.e. the foods of Modena). Tuscany has saffron, which it could exploit more than it does in its cuisine. The conclusion that I’ve reached is that Tuscan cuisine while more varied is still not as elegant than that of the Emilia-Romagna. Bologna, you have ruined me. I will say that in my first days in Bologna, I missed the street food culture of Florence. This is something that makes Florence really special, and there are loads of quality snack bars in the city like Semel’s panini, Le Volpi e L’Uva’s crostini, tagliere boards of fennel salami and cave aged pecorino, the new fried dough Coccoleria (Il Coccolo near Santa Croce) that I am obsessed with even if part of the Prosciutteria chain, and all the lampredotto stands that warm my food loving soul. I think Florentines are a lot more charming than the Bolognesi in certain ways and I missed their gregarious aspirated demeanor. Their outlandish, animated personalities (compared to the Bolognese, who seem to me a bit more reserved), Their pride to show off anything they do or make. The artisan culture here in Florence is definitely special, and I don’t think that it’s dying the way certain travel media outlets have painted it. Although Bologna has a thriving design scene with countless makers up with the times. So I talked about Pasta and Palates- what about chefs? To be extremely honest, I have yet to be impressed by many fancy pants chefs in Florence. Fancy pants = fine/contemporary dining. I’ve had this conversation with chef Damiano of Club Culinario in Florence and we both agree that there is virtually no one in this city creating food. Not just copying some impressive technique like powder sprays and foams. 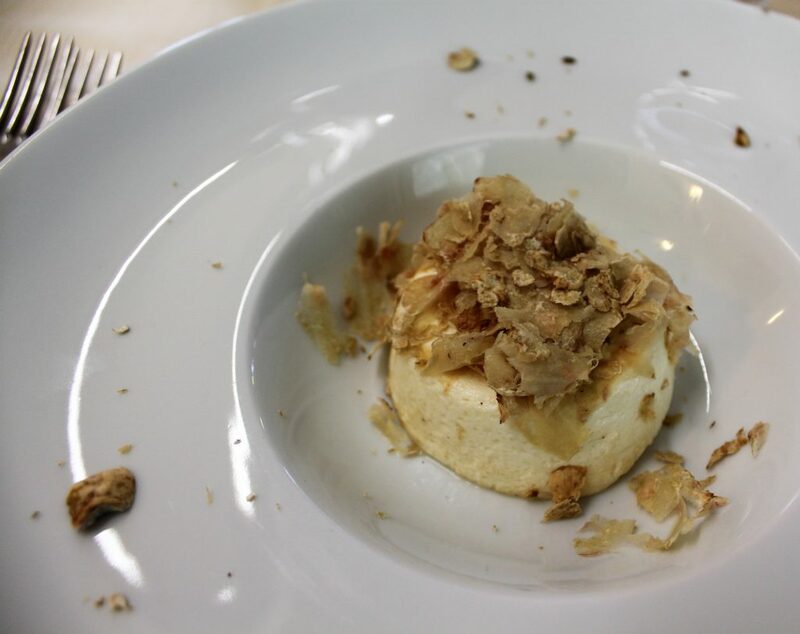 Damiano used Massimo Bottura as a benchmark of an Italian chef who is creating something. That being said, I will say some of my favorite fine/fancy pants dining so far in Florence/Tuscany has been under the hands of chefs Maria Probst and Natascia Santandrea of La Tenda Rossa in Cerbaia, whose restaurant isn’t in Florence but do periodic pop-ups in the city and around the region, Marco Stabile of Ora d’Aria and Io Osteria Personale. My last week in Bologna was quite fruitful. 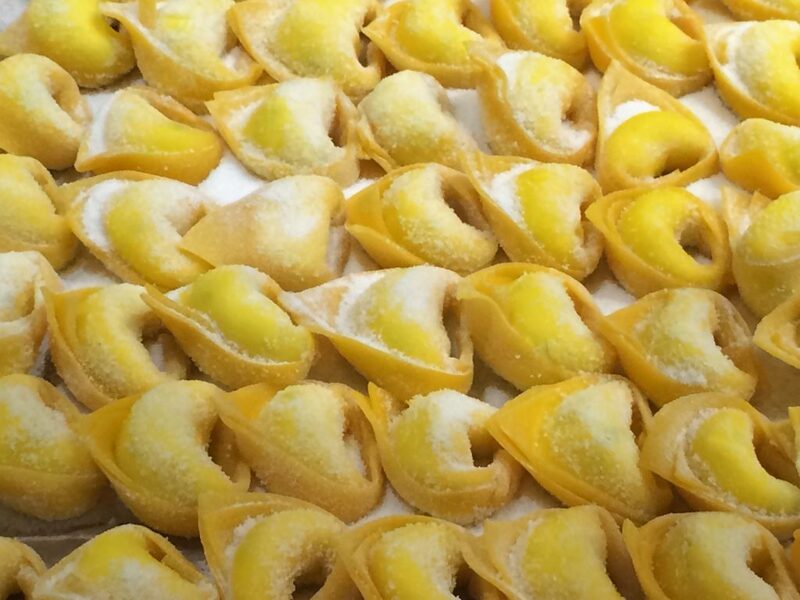 I found the best tortellini I was looking for (pictured) by the reported queen of tortellini, Lucia Antonelli. She was extremely kind and answered all my questions to my hearts content, sitting down with us after eating one of the best meals ever. 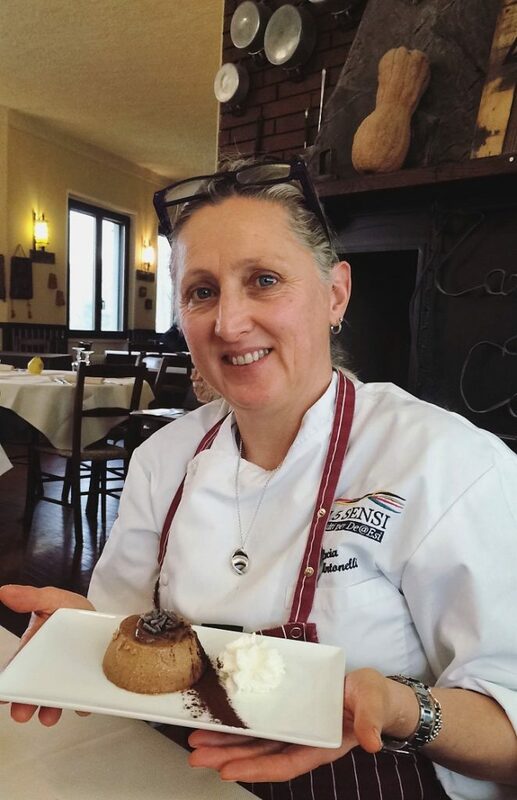 My friend Patrizia took me to her culinary heaven in the Apennines, which is only reachable by car friends, but a necessary trek. I also got to meet some discerning palates in the food and wine scene there, including Benedetta Cucci and especially Luca Bardi who I wish every single Bolognese or rather food critic/writer was like. While the Bolognesi a bit more reserved than the Florentines, are a little more welcoming in my industry circles than Florence. All in all, it was a wonderful experience that has totally changed my palate in such a short amount of time. I’m back in Florence, and that might be a good thing. For both my dress size, pancreas, blood pressure and cholesterol levels. 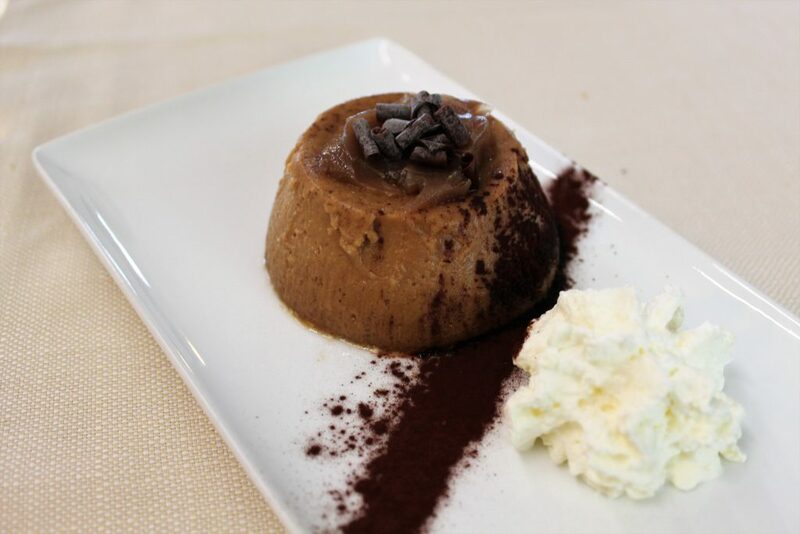 Chestnut pudding with a heart of marron glace and shaved dark chocolate. And of course, panna. Hey! For more posts, subscribe to my blog and newsletter? I’ll be writing a few eating and drinking guides to Bologna, plus some food tours there are in the works- so stay tuned! As always, live tips on Instagram and Facebook- buon appetito!